A classic San Francisco apartment with hardwoods, crown molding & bay windows. 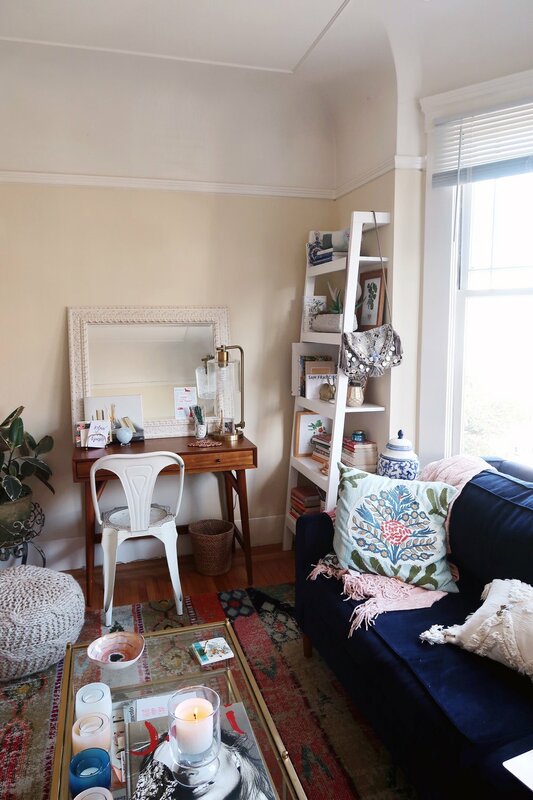 I thought it’d be fun to put together a complete apartment tour of my current space! I’m planning on featuring a few of my friend’s spaces in 2019, so to kick it off, I realized I probably needed mine on the site as well. This building was built in 1920 and has so much detail and charm. I love everything about it — the location (my neighborhood is active and fun without being a total scene) and my unit itself. When I first found this place on Craigslist, I wasn’t sure what I’d think. I had just found the cutest place the week prior (a similar style apartment on the other side of Golden Gate Park, with an actual bedroom!) but had just heard back that I hadn’t gotten it. Apartment hunting in San Francisco can be really discouraging sometimes! But as soon as I stepped into my now home, I felt a connection. I loved that it was located next to a beautiful church, and my kitchen happened to have a view of the church’s giant rose window! I’m a Christian and very active in my church. It’s so nice to sit in my kitchen to do bible study or quiet time in the mornings and feel so connected to God. Now, there are totally things I wish I could change. 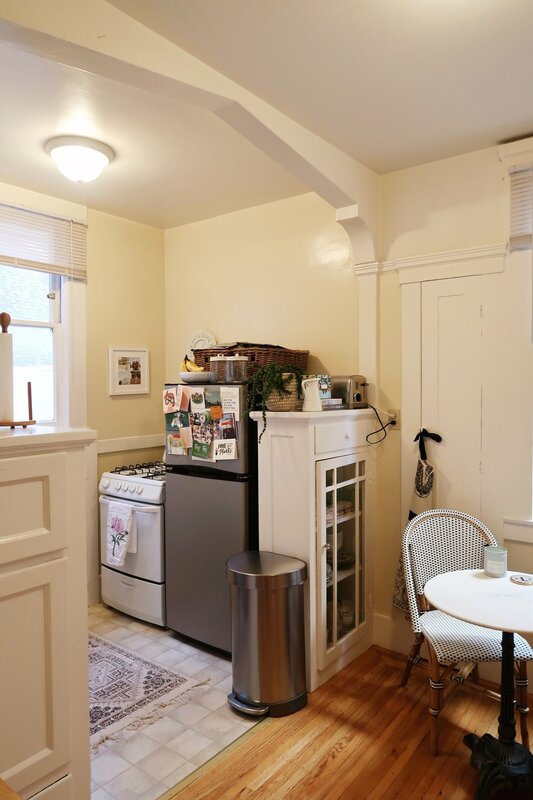 For instance, in-unit laundry would be amazing but that’s almost unheard of in most of these old apartments. It would be great to have an actual bedroom, but studio living has surprised me in so many ways, and given me an opportunity to be super creative with the way I define and style my space to serve multiple purposes. My apartment has been such a gift to me this past year and I know I’m going to make so many more memories in it. I can totally see myself living here until I meet someone… which could be in six months or in five years! Regardless of the timeline, I am cherishing my experience day by day. It’s so fun to live alone and have the opportunity to make a space totally and completely your own. Without further ado… here is my space! Enjoy! The living space of my studio is well-lit and large! I have an enormous walk-in closet (definitely big enough for a bed!) with my dresser, laundry basket, and shelving for accessories and shoes! To be totally honest, it becomes a mess very quickly so I didn’t photograph it for this tour. I do plan on sharing a closet makeover soon though. The thing that got me about this place were the enormous bay windows. It’s a totally classic San Francisco detail that I was so happy to find in an apartment, since my last place in the Marina didn’t have them. It really makes it feel like I’m a city dweller. Though I face the street, the noise isn’t bad and I have a nice view! My favorite thing is curling up on my couch to watch the fog roll in over the hills nearby. Most of my furniture in this room I already owned before my move. I had just refurnished my entire living room in my Marina flat when I decided to move out on my own, so I took it all with me! My rug is 9x12 and fits wonderfully. 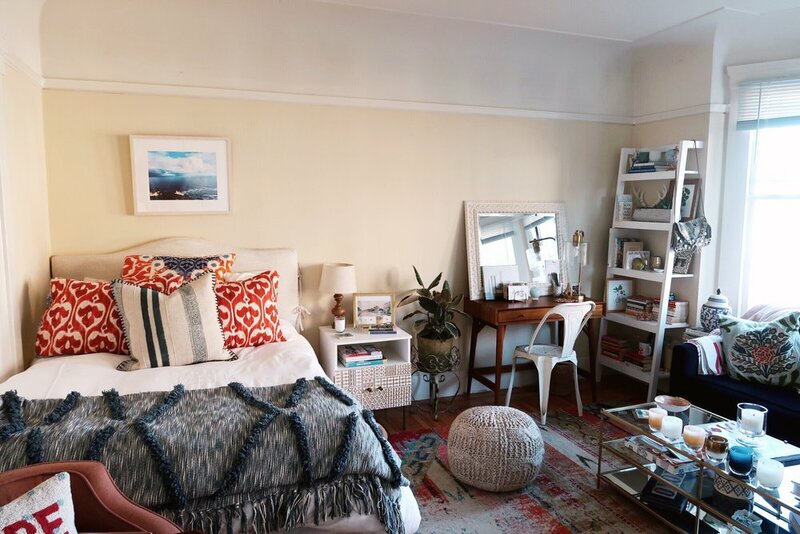 It pulls the space together and adds a boho vibe to the space. 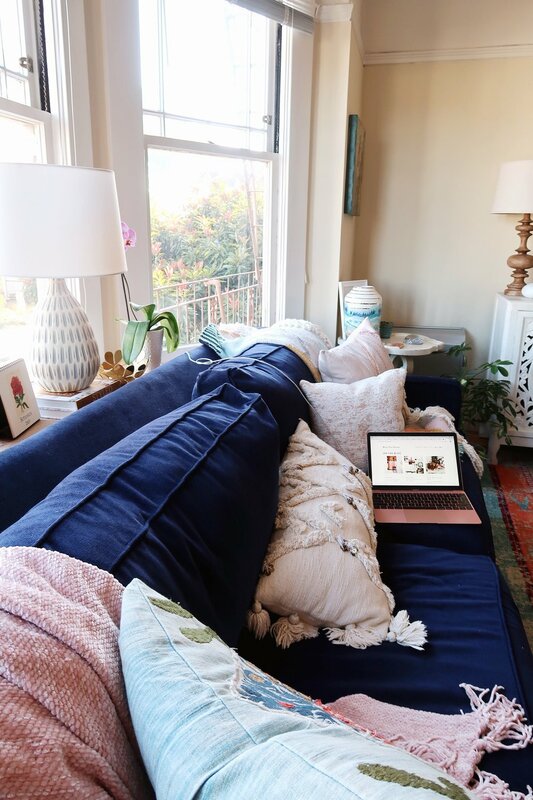 The couch is the West Elm Paidge Grand Sofa (all links are below) and I ended up getting the poly-filled blue velvet. It’s seriously the comfiest and I sometimes fall asleep on it! My biggest splurge was the Lombok Buffet that I use for my TV stand. It is so beautiful and I’d be eyeing it for a couple years before I finally had the chance to get it. The storage is incredible, too. I keep all of my candles (I’m a total hoarder), scrapbooking and craft supplies, board games and other items in there. Having hidden storage in your living space is so helpful. It keeps it from feeling too cluttered and chaotic! I have sooo many books and candles and little trinkets, and I can’t keep them all out at once, so I often re-style my coffee table to keep things fresh. Speaking of display space, I recently got a library table to put behind my couch. It’s been nice having an extra reading light and a place to display plants. My landlord was actually the one who suggested closing this door that leads into the kitchen to get the most use out of the space. I ended putting my bed up against the wall (which I normally hate!) because it was really the only way to make it all work. At least it keeps my sleeping space relatively separate from the rest of the room. 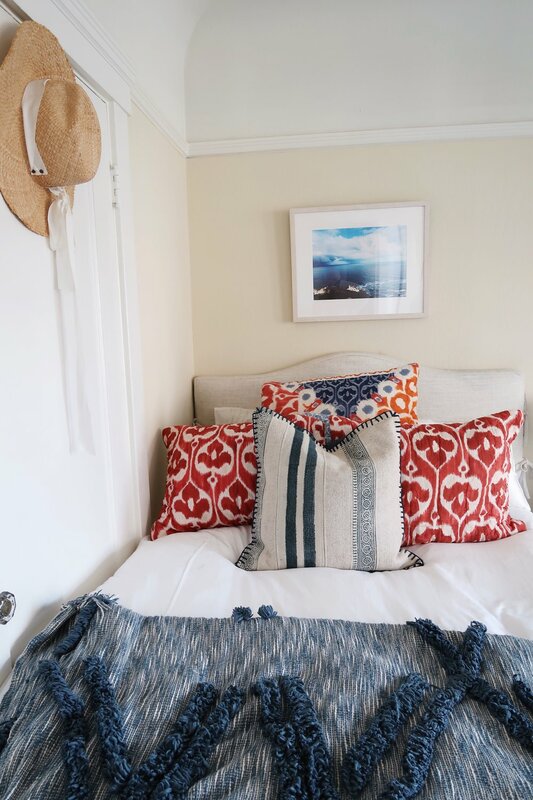 I’ve made quite a cozy corner for myself by keeping my bedding bright and adding details like the framed photo of the Point Reyes lighthouse that I took earlier last year, and a sweet sunhat. My bedside table was a recent investment and I love it because it has cute little doors for storage! I try to keep my bedside totally clear of things that don’t bring me peace. The pink chair at the foot of my bed helps define the sleeping area a little bit, since it’s close to the door where you walk in. My sweet wooden tray was a gift from my mom a couple of years ago — we found it together at a store in Marin that has since closed. It’s the perfect entry table! I love my kitchen space! It’s probably my favorite part of the apartment. I love the archway and the molding, the light and the big window facing the church. I went with a subtle Paris theme for my kitchen space. I knew I wanted bistro chairs for that cafe vibe, so I started there and the rest just fell into place naturally! I have very minimal counter space and outlets (there are only two in the kitchen, in very inconvenient spots) so I had to be creative with what I brought in for extra counter space. 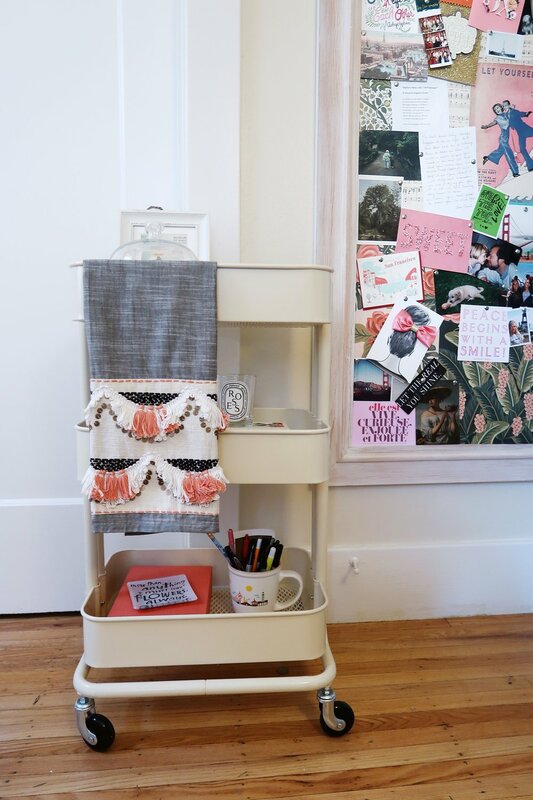 I love the two rolling kitchen carts (one with a butcher block, one from Ikea) to help hold all my supplies and trinkets. Kitchen organization can be really fun if you put some thought into it! I ended up storing all my cleaning supplies and pots and pans in these cool wicker baskets from Container Store under my sink area, which is exposed. It keeps things organized and they match the baskets on top of the fridge, which hold more baking supplies and all my extra dish towels. The cabinet space with the lamp on top is actually the old ice chest! Now it holds my saran wrap, ziploc bags, and other items like my hand mixer and food processor. Since the only place for a microwave was on top of the kitchen cart, I tried my hardest to make it look cute and styled. I hate the way microwaves look, and wish there were cuter ones out there that were actually functional! I used the pretty Paris print from Minted to tie together the look, stacking some design catalogues above the microwave with a cute teapot I got from work. My Nespresso was a Christmas present to myself, and has quickly become a part of my morning routine. I’m quite the magazine reader, so I stack up my favorite issues on the cart for a nice and clean look. When I first moved in, the entry to the kitchen had a door that I asked my landlord to remove since it really closed off the space. 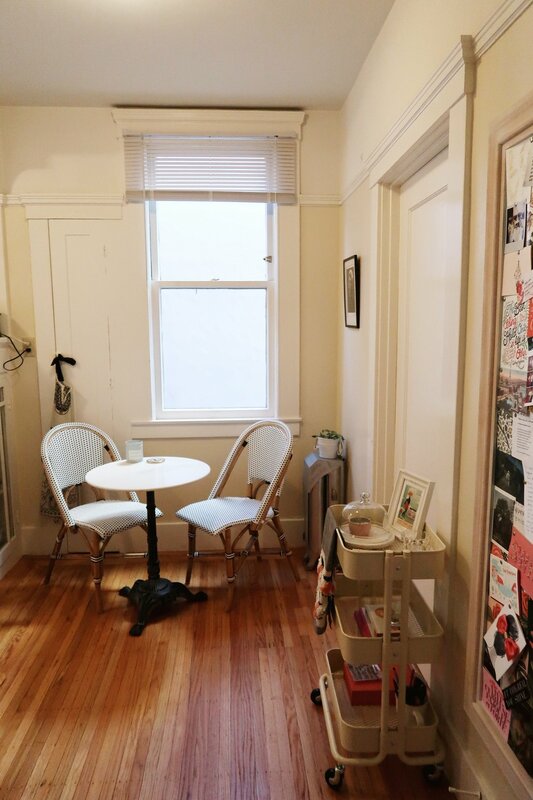 I wanted to walk into my apartment and see the bistro table and chairs right away! Since I now had a lot of wall space to cover, I added the large vertical pin board and created a colorful vision board for myself. It includes tons of cards I’ve collected over the years, along with other photos and memorable mementos. When friends come over, they always comment on it! Collaging is one of my favorite things and I actually did an Instagram tutorial that you can watch here! If you are wondering about the sweet portrait above my dining nook, that’s my grandmother! I think that was her sorority composite photo from the late 1940s, but I’m not totally sure! Her middle name is Bliss (which inspired Bliss This House) and I know it’s a name I will pass down if I have a daughter someday. 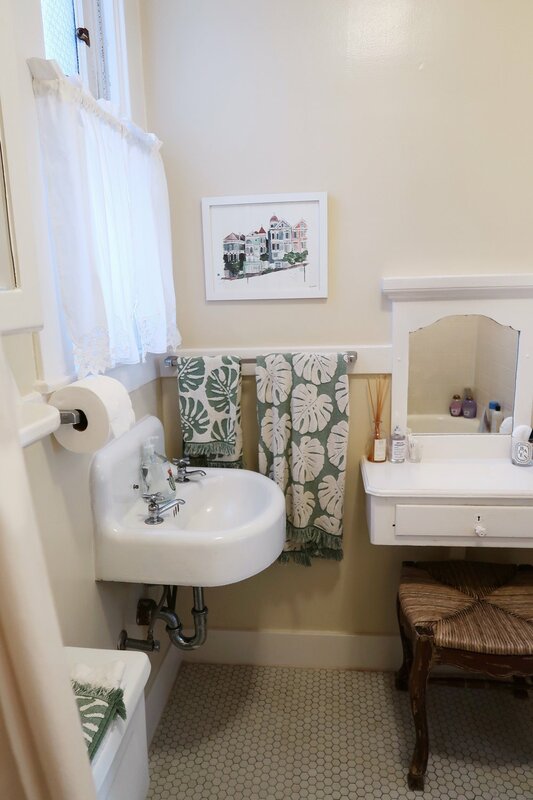 This little bathroom is so quaint and cute! The light isn’t that great, but I’ve made it work by keeping the linens light and airy. 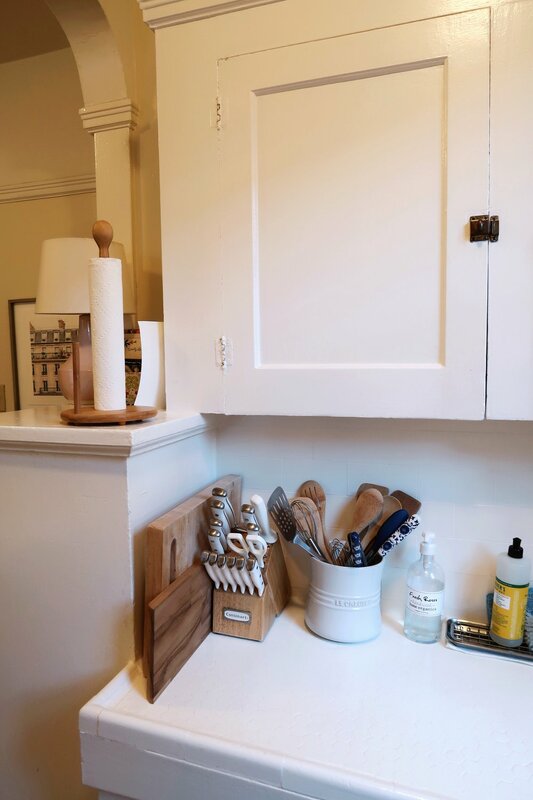 The built-in vanity is where I do my makeup and hair in the mornings, and it’s been the perfect space to display pretty perfumes and also host cotton balls, q-tips and other daily needs. Since my window actually looks out across to my neighbor’s bathroom (about 15-20 feet away), my mom suggested I add these cute cafe curtains. They really added a feminine touch to the space! I love the way they look. That’s a wrap! I hope you enjoyed seeing my space and it provided you with inspiration for your own! If you loved this post then you will LOVE my free printable apartment checklist. Sign up with the link below for your free download. 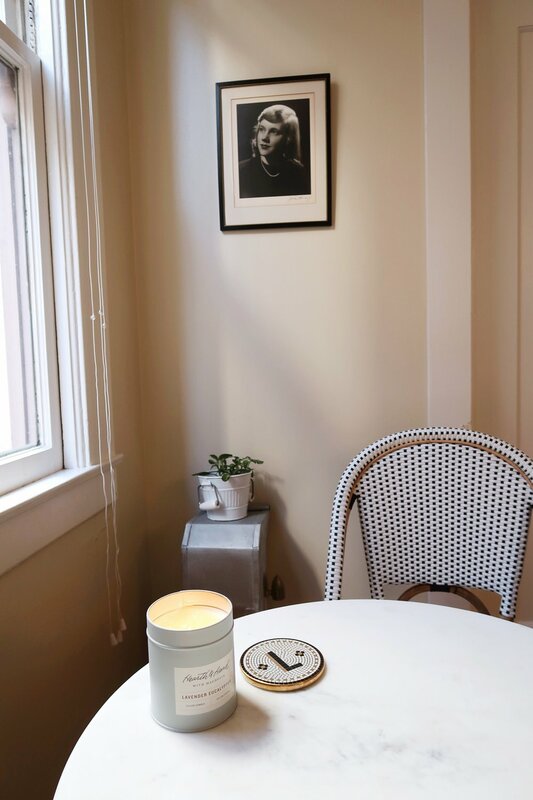 It’s the perfect shopping companion for girls decorating their first ever apartment, or if you are a long-time apartment dweller that just needs a little refresher. Get access to my free printable apartment checklist! Thank you for subscribing! Check your inbox for more BLISS! Let me know in the comments — what part of your home are you most happy with? What needs more work (or a total design overhaul?) I’d love to hear about it!